“They” (whoever “they” are) say that “money can’t buy happiness”. Oprah’s reaction to this claim was to state that: “Well apparently “They”… have not been shopping at the right stores”. Maybe money can’t buy happiness. But most of us would probably like a chance to prove that for ourselves, just in case maybe money can buy at least some happiness and anyhow it can certainly buy a lot of other things if not happiness. Being independently wealthy would bring to you a huge number of benefits to choose from. The point is that being wealthy makes available many wonderful choices in life. Choices that are not possible without wealth. For many of us wealth is a worthwhile goal to strive for. A reliable way to become wealthy is to invest a meaningful portion of your income (such as 5% to 10% of gross pay) into the stocks of quality corporations. History shows that if this approach is followed over a working career, substantial wealth will result by retirement age. Wealth will result if one can match the market averages over the years. Obviously the process will be accelerated if one can beat the market averages over the years. At some point a stock portfolio will (with proper care and feeding) grow to the point where it is self-sustaining. Where it is growing so quickly that no further contributions are needed and eventually it will tend to grow to a point where significant withdrawals can be made year after year. Accumulating wealth involves some sacrifices. And in almost all cases it takes at least a couple of decades. But those decades are going to go by whether we use them to get wealthy or not. There are many valid reasons that investors work hard at growing their wealth. It’s not only to fund a retirement. It’s also get into a position to take advantage of the many benefits of wealth. On June 7, I emailed the list for this free newsletter and alerted people that some record low mortgage rates were on offer. In Alberta an amazing rate of 3.5% for five years was available for a very limited time from Alberta Treasury Branches. They have now raised their five year rate substantially to 4.55%. Saving 1.05% on a $200,000 mortgage is $2100 per year, which is certainly worthwhile for those Albertan’s who happened to need a five year mortgage. (It was also possible to renew early to get this deal). In that same email I indicated that the 5-year rate from ING Direct was 3.99% and that: “Mortgage rates have started to edge up and now may be the last chance to lock in at or near the lowest rates ever”. Well, the ING rate is now up to 4.39%. Not a huge increase but on a larger mortgage the savings from getting a 3.99% would certainly add up over five years. I am aware of a few subscribers to this free newsletter who took prompt action and took the opportunity to save. If you did as a result of my email, I’d be interested to know. One subscriber to this free newsletter questioned why I was advertising mortgages. As I stated in my June 7 email, I got no benefit from this. I simply wanted to pass along valuable information. Another opportunity presented it self in early March. After a huge drop in 2008 the markets had taken another hefty drop by early March of this year. Stocks bottomed out a week later on March 9 and then both the Toronto Stock index and the &P 500 rose over 40% by mid-June. Those of you that seized the moment when stocks were looking very attractive in early March have done very well. As disclosed to our paid subscribers, I personally was buying in early March. I bought Canadian Western Bank, Aeroplan and Berkshire Hathaway. Since then I have sold portions of these for reasonable gains. By mid-June it was becoming apparent that early March may have offered one of the best opportunities of a lifetime to acquire certain stocks and corporate bonds. I’m glad I was doing at least some buying at that time. Meanwhile many people were swearing off stocks because of the losses in their portfolios. Well by early March there was nothing to be done about past losses, but future gains were there for the taking. I find it interesting and gratifying to see where in the world visitors to this Site reside. I use Google Analytics to track this data. It does not tell me who visited but it does tell me where our visitors come from. Amazingly enough, in the past 12 months we have had visitors from 160 Countries. There are about 195 countries in the world. The countries that had no visits to this Site were most of the central African countries and a few in the middle east. Other than those areas, we had at least one visitor from just about every country. The following are the number of visits from our top 20 visitor countries. 1. Canada 41,728 Not surprising, as much of our work is geared primarily to Canadians. 2. United States 37,269 This reflects that fact that we do have some America stock picks and most of our articles are applicable to all investors and certainly to all North American investors. 4. India 1,157 I would not have guessed that India would be our number four. 12. China 328 I am gratified to have any visits from China but with over 1400 million people, I guess I have room to grow in China! 19. Mexico 195 It’s disappointing to see so few from Mexico. Probably not a big enough investor class of people and or not enough internet access. It’s great to see people visiting from all over the world. Keep it up. It’s always interesting too to get emails from countries far from Canada (whether that be geographically far or politically and culturally far from Canada). For the most part I have the mighty and amazing Google to thank for this traffic. Thank you Google. It’s well known that Canada’s Population has been aging at an amazingly fast rate. 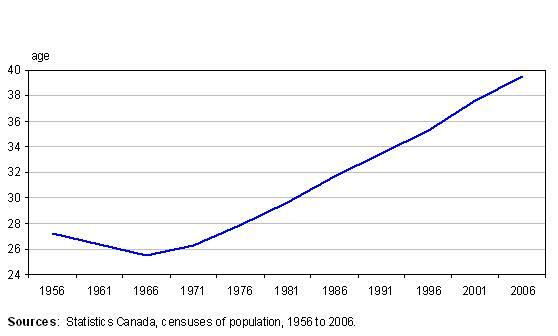 In 1966 after the baby boom, the median age of a Canadian was under 26. In 2001 the median age of a Canadian was 37.6. It then jumped to 39.5 in 2006. While the trend appears to be going steadily up it will no doubt level off at some point. It seems to me there may come a “tipping” point. As the bulge of the baby boomers moves though their 50’s and 60’s ,at some point there will be major shifts in buying patterns. A 60-year old may have spending patterns not so different from a 40-year old. But I suspect the spending patterns of a 70-year old may be quite different from those of the working age population. This has implications for many businesses. This figure shows the proportion of persons aged 65 years and over in the Canadian population from 1956 to 2006. It looks like the rates are stable from 1956 to 1966, with 7.7% in 1956, 7.6% in 1961 and 7.7% in 1966. Then the rates grow constantly until today, going from 8.1% in 1971 to 8.7% in 1976, to 9.7% in 1981, to 10.7% in 1986, to 11.6% in 1991, to 12.2% in 1996, to 13.0% in 2001 and finally to 13.7% in 2006. 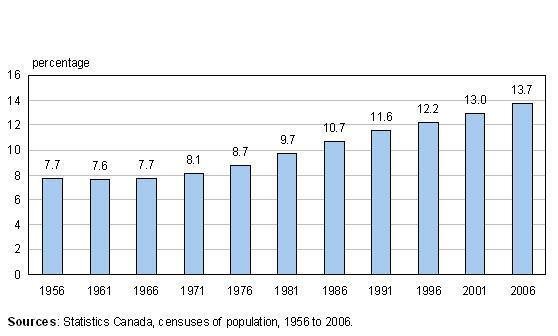 Sources: Statistics Canada, censuses of population, 1956 to 2006. Let’s assume that on average those over 65 no longer work. Many do, but this is probably offset by the many people under 65 who are no longer working. Clearly, Canada has a growing percentage of people who are not working. Consider the fact that goods and services are produced by workers. If a higher percentage of people are not working, then there are less goods and services available. The real issue economically, is the ratio of workers to non-workers. Non-workers include retirees, those adults unable to work, the unemployed and even children. All else being equal, it becomes a greater burden as the size of the pool of workers shrinks relative to the size of the pool of non-workers. If at one point in time there are 3 workers for every non worker and then later due to demographics there are only 2 workers for every non-worker then, all else being equally, this is a huge increase in the burden of workers supporting non-workers. Luckily, all else is never equal. A constantly growing base of completed housing, factories, knowledge and other infrastructure of all kinds adds constantly to human productivity. Nevertheless a demographic future where there are is a lower number of workers for each non-worker could be quite problematic. Possible solutions include increased birth rates and/or an increase in the immigration of young skilled workers.